Please join Wednesday, May 5th for a Michel Cluizel chocolate tasting and a discussion around coffee production, fair trade and coffee roasting led by coffee expert Jane Ganes-Chase & coffee roaster Chad Smith! 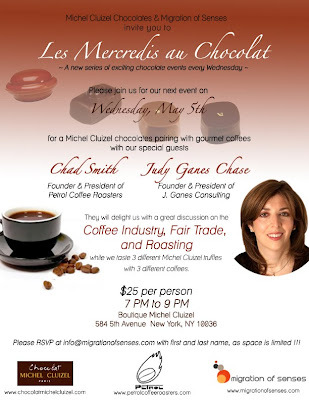 What: Fabulous Michel Cluizel chocolate tasting and discussion around coffee production, fair trade and coffee roasting led by THE coffee expert Jane Ganes-Chase (J. Ganes Consulting) & coffee roaster "on demand" Chad Smith (Petrol Coffee Roasters). $25 per person. RSVP at info@migrationofsenses.com with first and last name, as space is very limited.